My understanding of rod design and rod performance has accelerated since I started fishing for Perch in my local canal. 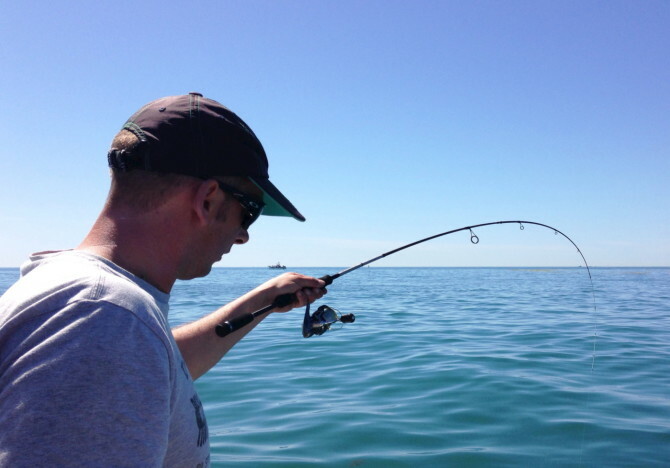 Unlike the sea, conditions are more often than not suitable for throwing the tiniest lures. We're often talking 1-inch plastics and jigheads under a gram. To me, it's this style of fishing that has amplified the importance of using a balanced outfit. I thought I'd share where my head is at currently. Subject to change. As we know, there are two key types of UL rod design. Tubular and Solid Tip. Tubular means the blank is manufactured in one-piece - sometimes broken into sections to aid transportation. With a Solid Tip, a solid section of blank is spliced into the tubular section, at the tip. Because there is a join between the solid and hollow sections, vibrations sent down the rod to the angler can be softened. Feels more like elastic than steel. The impact of this effect is often magnified with a lower quality blank. Expensive blanks reduce this effect. Solid tip rods are great for inhaling eaters like Perch or Bass. The same loss of feel for the angler actually turns into a positive as the fish also feels less (resistance) and is able to take a bait more readily. If there is little to no 'slack' in the system - for example vertical drop shot - the elasticity of a solid tip should help catch rate. With inhalers like Perch, confidently able to take the lure fully into their mouths with less resistance. However, if you're fishing some slack - for instance the sink and draw method - then you may find that the added feel of a tubular blank outperforms the benefits of a softer solid tip. Generally speaking, solid tips aren't as good at casting. They're less likely to load smoothly and consequently casting accuracy can be reduced. In some instances the tip will fold up during the cast and make the effective length of the rod shorter, which generally translates to shorter casts (although this may not be important to you). For me, there are two key attributes required for success with a rod. 'Feel' and 'Balance'. Feel being the level of 'activity' transmitted from the lure to your hand, allowing you to react to this feedback. And Balance being the rod's ability to control the tiny lures, required by UL disciplines. Within this is obviously casting itself and the action you impart upon the lure. Speaking of which. Tubular tipped rods are better at working hard lures. If you're trying to impart an action upon a lure, you want your efforts to be translated down to the lure, not lost in the rod tip. Generally speaking, if you splice a solid tip into a rod design, you'll lose something in the feel. But that's not always bad. The manufacturing process of tubular rods has limitations in the achievable lightness and low end casting weight (balance). At the lightest end of the scale, tubular rods get very expensive, very quickly. A 5g tubular rod is a very rare and specialist bit of equipment. It offers the very best in sensitivity (feel) and balance for using light lures. But at a price. Top end tubular rods at the lighter end of the spectrum are fairly fragile things, as well as expensive. Not the best combination of attributes! I said I thought solid tips suited vertical drop shot fishing better than tubular. One exception stands out for me. Fishing for Zander. You could argue that UL rods aren't best suited to Zander. But I think more specifically, soft tipped rods aren't suited for Zander. They don't inhale their prey, they snap at them, using their teeth to pin them. So a soft tip isn't necessary like it can be for inhaling species. But you do need to hit them pretty quick and set the hook in that bony mouth. So a tubular rod can give you the edge in both feeling the hit and setting the hook. Work in progress, but what appears important is that you choose the right weapon for the right quarry and technique. SG lr 0.5 -7g wonderfull rod felt great in the hand used all day held low down power well and felt less brittle than thr tronix tips but it did break on me out of the blue in an odd place and was over twice the price of the tronix option’s which put me off replacing it. Now im looking for a tele rod option so far the savage gear 2-12g version seems my best bet ? Hi Paul. Thanks for your comments. The Tronix rods are a great starting point at that price. Unless rods have Fuji fittings, it’s hard to justify paying more on a low to medium price range rod. But I would say that there is definitely a pay back on upgrading to a premium blank. Normally that means Japanese manufacture, although there are some great blanks in Europe and the US too. These start to appear around £100, which I realise is a small fortune. But there is value in the better blanks. Do you mean you’re looking for a telescopic rod? I see. I’ve not found the perfect travel rod yet (well I have, but it was way too expensive). As it happens I tried the Spro Mobile Stick last week and I thought it was nice. Certainly as good, if not a little better than other travel rods I’ve used. I’m not so keen on my Sonik SK4, although I’ve been abusing it for a few years now. My Sakura is over-rated on casting weight. Think that’s quite common for travel rods. And the only true telescopic I know of was by Golden Mean, but I’ve not seen it in the UK for a while. Lure Heaven had it I think. Hope something there helps. Quite comprehensive answers about those rods however I am not convinced which one to buy. Think we are both in about the same spot with solid v tubular. I have been using one piece rods of late and they have certainly grown on me. I have also been playing with 2 rods from Rapture. Two piece 0.5g to 5g versions. Terrific actions, one with an extra fast blank and solid tip which I am using for ultralight and drop shot, one with a medium fast blank and tubular tip which works with micro hard baits and small paddles….just need to sort the handles out on most rods now. I like to be able to touch the blank with my fingers and if possible thumb. Anything to get the most feedback. So rwo or three inches of cork above the reel fitting, metal sleeve or fancy whipping above the cork and over the blank are all no no’s to me…work in progress as you say. cheers Trev. Take it I will see you on the next BLAC on the canal? Hey Trev! Thanks for commenting. Yes, sounds like we’re on the same wavelength. Handle design is definitely the new frontier! Yes. I’ll be there. Looking forward to that one. See you soon. This is an invite to come fish zander here soon, as we are all conviced they are the number one inhalers out there! Okay Ward. Invite accepted! Any insight on Zander would be a gift. Although I still don’t understand the teeth. I think the whole issue of “Inhalation V Biting” is both interesting and confusing. Let’s be clear, Perch, Pike and Zander all inhale to a certain extent, particularly if the bait is relatively static (vertical or drop shot). The vast amount of underwater footage now on youtube, particularly of Pike strikes shows that pretty much every time a pike attacks a lure it’s gills flare and water is expelled. However with a moving bait there is obviously also a movement forward with the head and an opening and shutting of the mouth..so it’s a combination of bite and inhalation. There are far fewer online videos of Zander hitting lures, although there are a few of Walleye, however these are mostly of static jigged baits (often ice fishing) again there is the gill flairing and expulsion of water as well as a bite action. Perch of the three probably inhale the most, although they do bite/mothership* as well (*Mothership is the term Gary and I coined for fish that swim behind lures, and overtake with their mouth open and thus engulf lures..a bit like the baddy spaceship in Moonraker). Certainly both pike and zander hit lures that they would not be capable of just inhaling (Gary had a double figure zander on an eight inch BBZ in the Gloucester Canal) and they very often “clamp” lures with their teeth and simply let go as you bring them to the net, which would indicate a bite action rather than just inhalation. I’ve had tails bitten off soft shads by pike, perch and zander, so they all bite at the tails at times. At the end of the day the real key is the way the lure is fished. If it’s static on the bottom, or relatively static because you are fishing it very slowly, vertical or drop shot, then you might want to ensure that you don’t have too much weight involved, to make it easier for all three species to inhale the lure. You might also want to use a solid tip to reduce the resistance. However if you are fishing with a fairly steady retrieve, then it does’t matter how much the fish inhales, it will need to attack/bite the lure to get it into it’s mouth. There is virtually no stretch in modern lure fishing lines, so there is no way that inhaling will make the lure go backwards if it’s being reeled-in, in the opposite direction . So for static-ish methods then a solid tip that might bend when the fish inhales might be an advantage (I’d love to actually see proof that a 1/2 pound perch inhaling a lure 20 feet away will actually bend the rod tip though). For Zander though I would always go for a tubular tip, their mouths are just too bony to set hooks consistently with a soft solid tip, I’ve done it when drop shotting for perch and was using very small, sharp hooks, but it’s very hit to miss. ‘Mothership’ made me smile. You’ve managed to plant a space ship in my aquatic mind’s eye. Congratulations. Hi Adam, after much deliberation (confusing stuff trying to pick your first lure setup) I thought I’d settled on the Rockfish T UL that you reviewed in February 2016. Then I came across a Rockfish 2 UL going for a very reasonable £22.99. This has given me the dilemma of tubular vs solid. Two years on, what are your thoughts today? I plan to target perch, mainly on the Basingstoke Canal. I’d like to try a mix of jigging and drop shotting. Am I right in thinking that solid tip is the way to go? Hi Richard. For your first rod, yes. I would go for solid tip. You’ll catch more fish and gain more confidence.